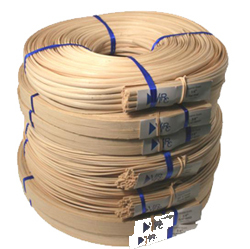 Reed is inner material from the tropical vine “calamus rotang”. It is durable, flexible, and when soaked, it is very easy to weave with. 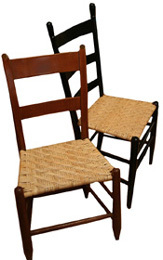 As such, it makes a great choice for any indoor chair seat with rung or dowel construction. It’s also suitable for protected areas, if you don’t have a lot of rain or humidity. If your area is very wet, use it indoors only. Even for indoors, we recommend protecting the seat from strains by sealing with a Clear coating of Clear Weavers Stain. Flat, Flat Oval or Round, it’s sold by the “pound”. A “pound” is the same as a “hank”, “coil” or “bundle”. If you’re not sure what size or product you need, please visit our Choosing Your Supplies page for complete information on selecting your materials. Our Choosing Your Supplies page has recommendations for every kind of chair seat frame. Don’t know what to charge for Labor? Visit our Suggested Labor Charges page. All Reed is not created equal! We’re proud to offer our customers the highest quality of reed.